This is an Intel iPDS-100 CP/M computer from 1982 complete with EMV-51A ICE pod. 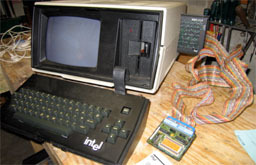 This was one of the first "lugable" computers, and was used for development of OS code for 8080 and 8085 based systems. The iPDS was the successor (ever so briefly) to the Intellec series of development/ICE boxes. This particular system was used by Columbia University for building embedded systems in the physics department; it's last task in that role was a small embedded measurement and control system for the Columbia research Tokamak fusion reactor. (If only people in NYC knew that they were mere blocks away from a nuclear -- NUCLEAR! -- reactor that operates on the same principle as the sun...! Well, some things are better left unknown!) Anyway, a good friend who worked on the Tokamak rescued this system from the trash and passed it on to me several years ago. I used it for various small bits of development and diagnostics (particularly for an ailing Tektronix 7A42 plug-in). The small circuit pod on the end of the ribbon attached to the main pod plugs into the host under test in place of the CPU (the bottom of the circuit pod has a CPU DIP), and the top part of that pod has the ICE CPU, with all the pins exposed for attachment of probes, etc.